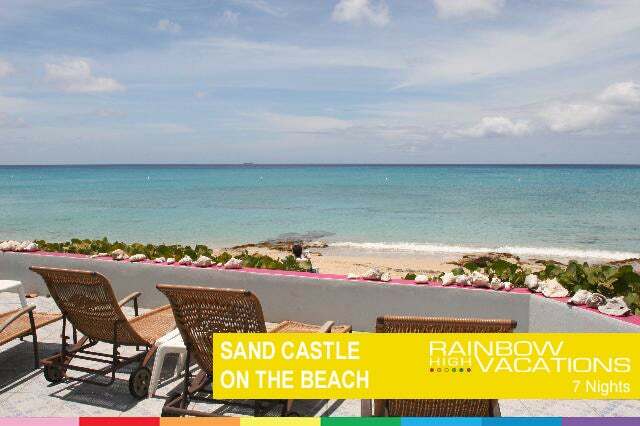 Sand Castle on the Beach is a lovely beachfront boutique hotel located on a 2 mile stretch of white sandy beach, one half mile south of St. Croix' historic town of Frederiksted. Offering the casual elegance and affordable Caribbean of days gone by, Sand Castle offers an exceptional collection of 21 different 1 or 2 bedroom suites and studios that matches any vacation style and budget. Amenities include 2 outdoor pools: beachfront and courtyard; fitness center; cable TV, in-room safes, tropical fresh flowers upon arrival, daily housekeeping, coffeemaker, hair dryer and iron. Unsurpassed beach side sunsets and views are a favorite property amenity. And rates include complimentary continental breakfast provided seaside every morning. Children 16 and older are welcome when accompanied by parents. WE BELIEVE IN COMMUNITY - As part of our ongoing commitment to our Community, Rainbow High Vacations will accept donations of any denomination to support ACT (Aids Committee of Toronto) which will be passed on to the organization on your behalf (a receipt for tax purposes can be supplied).